Discovered in 1864 by the Marquis Paul de Vibraye. It was the first Venus figure found in France. The Marquis was playfully reversing the appellation of "Venus pudica" ("modest Venus") that is used to describe a statue type of the Classical Venus which shows, in many statues the goddess attempting to conceal her breasts and pubic area from view. The inference the Marquis makes is that this prehistoric Venus makes no attempt to hide her sexuality. This ivory venus is 8 cm high, and has lost the head. The stomach is flat, and could be of a young girl. This is a valuable view, since it shows the rear of the statue. It appears to be of a young woman or girl at the stage of first menarche. This is shown by the small but developing breasts and buttocks. The overwhelming number of venus statues are of women who have already had children, especially examples from western Europe. This version is included because of its good surface detail of scratches and other markings. La vénus impudique, statuette en ronde-bosse en ivoire de mammouth. Découverte en 1864 par le marquis Paul de Vibraye, c'est la première figurine humaine découverte en France et l'une des plus célèbres. Nettement sexuée, mais sans poitrine développée, elle représente probablement une fillette. La tête a été anciennement fracturée. Hauteur 77 mm. Coll. P. de Vibraye. musée de l'homme. 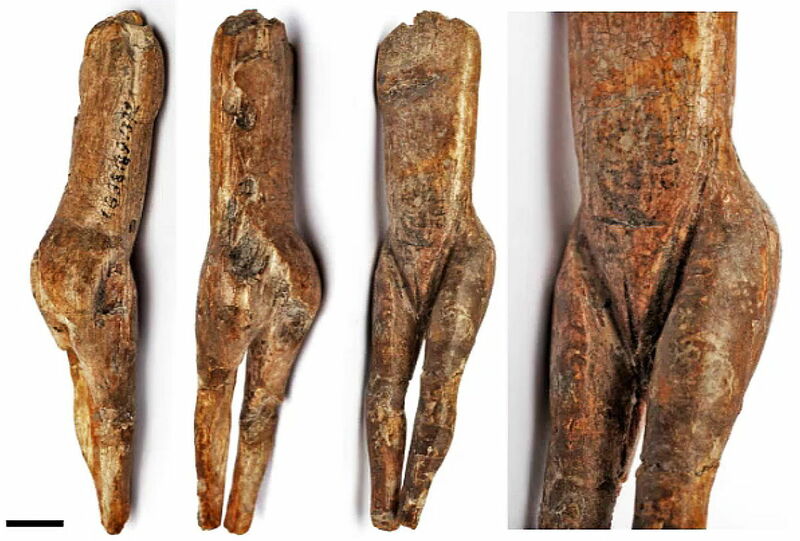 The Immodest Venus, a statuette in mammoth ivory. Discovered in 1864 by the Marquis Paul de Vibraye, it is the first human figurine discovered in France and one of most famous. Definitely sexual, but without developed breasts, it probably represents a young girl. The head was broken off before discovery. Height 77 mm Coll. P. de Vibraye. Musée de l'homme. Photo and French text: Visiter les Abris de Laugerie-Basse - Alain Roussot - Editions Sud-Ouest. La vénus impudique. Dessin de H. Breuil la représentant de trois-quarts et de dos. Vue de profil, cette statuette est très comparable à des dessins rupestres schématiques du Magdalénien, connus en Périgord, dans le Lot, la région aveyronnaise et en Allemagne à Gönnersdorf. Immodest Venus. Drawing of H. Breuil representing it as a three-quarter and back view. Seen in profile, this statuette is very comparable with Magdalenian drawings, known cave drawings in Périgord, in the Lot, the area Aveyron and in Germany at Gönnersdorf.